Yellowstone National Park is the largest and oldest of the national parks in the United States and it’s a very unique and exciting one. The reason? It’s an active supervolcano! I don’t know how many of you had that endless excitement for volcanoes, astronomy and dinosaurs as kids. We sure had and all those things which are mysterious and unknown seemed the most interesting of all. Questions which cannot be answered. Even if they will be answered finally, more new questions pop up. Actually, we haven’t changed much since then and that’s part of the reason why we became so excited to visit Yellowstone. Yellowstone was an unforgettable experience. In the first place, this park is so huge and varied, there’s completely different kind of landscapes to see in the different areas and the chance to see wildlife is quite high. But we enjoyed learning about the park and its geothermal features while exploring them just as much as the beautiful landscapes and wildlife encounters. 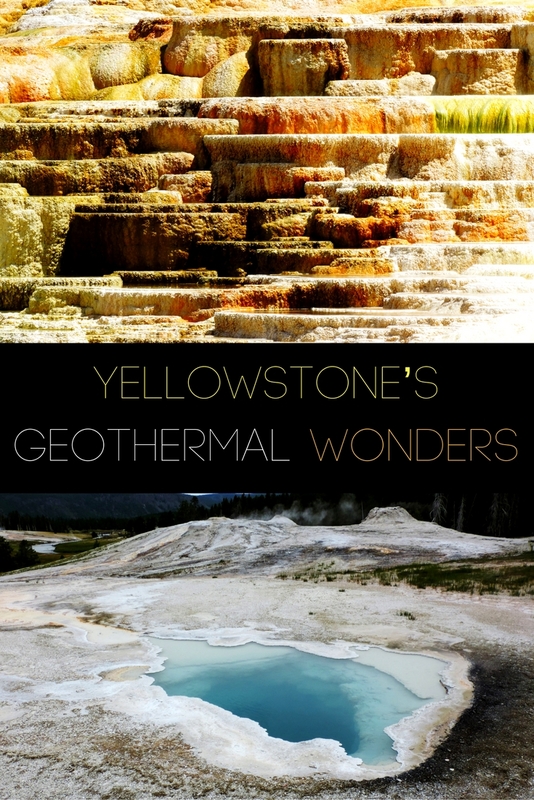 We’ve never thought we are so interested in geography but Yellowstone reminded us what we’ve known as small kids but probably forgot while growing up: learning about our world is so exciting! It always was and it always will be but somehow our thirst for knowledge was lost along the way through all the boring classes at school. We have to find it again from time to time. And being open and curious while travelling the world is something that really helps. What made Yellowstone so exciting to us is that we could see and smell there that something is going on. If you look around you won’t see anything that looks like a volcano but that’s because the whole park is the volcano. Yellowstone National Park actually sits atop the world’s largest active volcano. 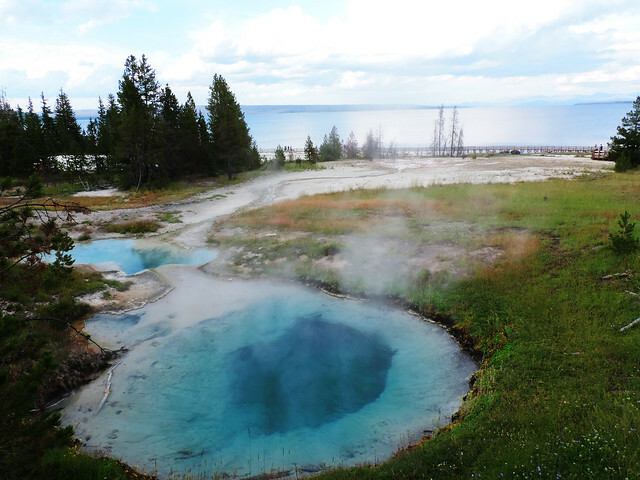 The magma is only 3-9 miles under your feet at some places and geysers, colorful hot springs, fumaroles, bubbling mudpots and steaming vents are everywhere to remind you that volcanism in Yellowstone is still active. The last eruption happened like 640000+ years ago but the magmatic heat powering it still powers the geothermal features of the park. Don’t worry though. According to scientists an eruption in the next few thousand years is extremely unlikely. But when it happens, it will probably change the world they say. Yellowstone is the largest active geyser field in the world and there are more than 10000 geysers and hot springs in the park. 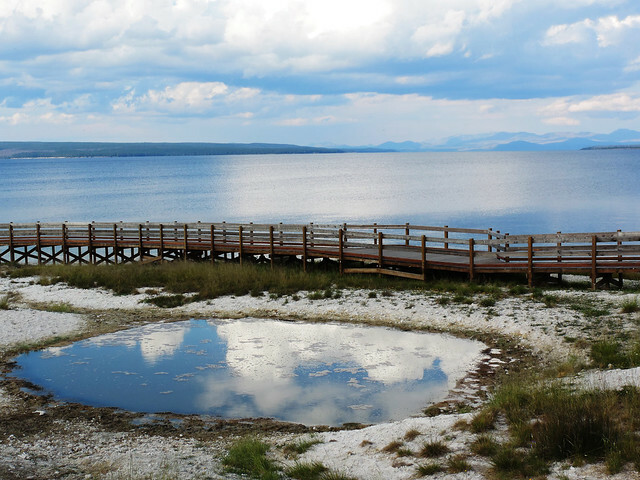 Several geyser basins can be visited on boardwalks and this is a place where it’s extremely important to stay on the boardwalks and maintained trails. It’s prohibited and very dangerous to walk elsewhere in the geothermal areas. Each geyser basin has its own wonders and geyser eruptions are spectacular! They are very unpredictable though. The only exception is Old Faithful. Old Faithful (located in the Upper Geyser Basin) faithfully erupts about every 60-110 minutes, the expected next eruption is usually posted at the visitor center. 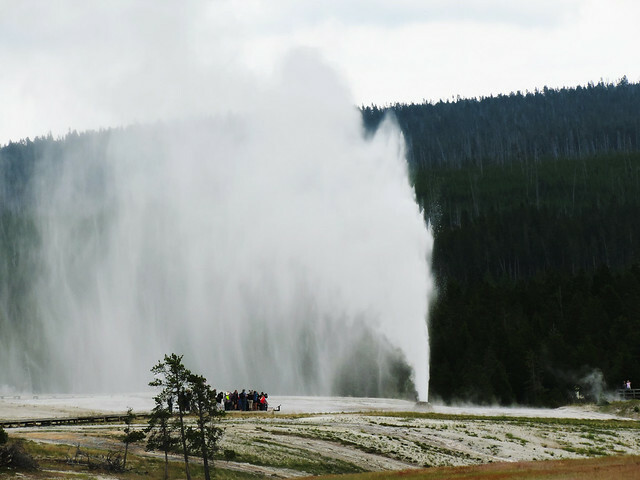 There are a lot of geysers which shoot up much higher than Old Faithful but their eruptions are not easy to predict. Some geysers erupt hourly or daily but some of them haven’t erupted since year. We enjoyed everything in Yellowstone so it’s a bit strange to even try to choose favorite places. Still, we have favorite geyser basins but it’s mostly because of luck: at the time of our visit they were the most spectacular. Upper Geyser Basin is the largest geyser basin and in addition to the amazing Old Faithful eruption we were also lucky to catch two even bigger eruptions in this basin. 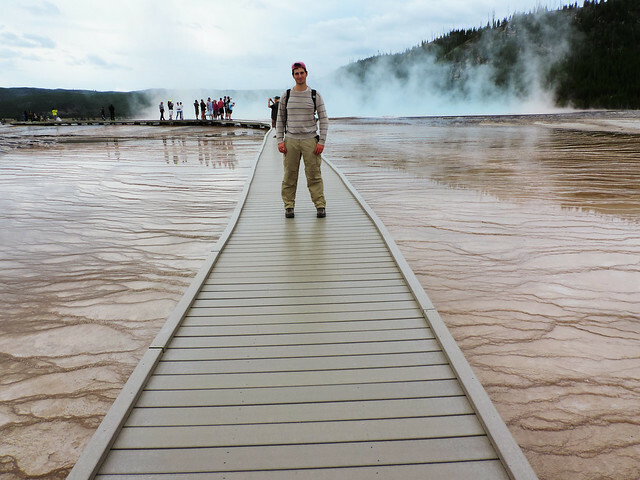 Our conclusion was: it’s definitely worth taking our time while exploring geyser basins. There’s no guarantee though. But when you see something you can be sure it’s special. 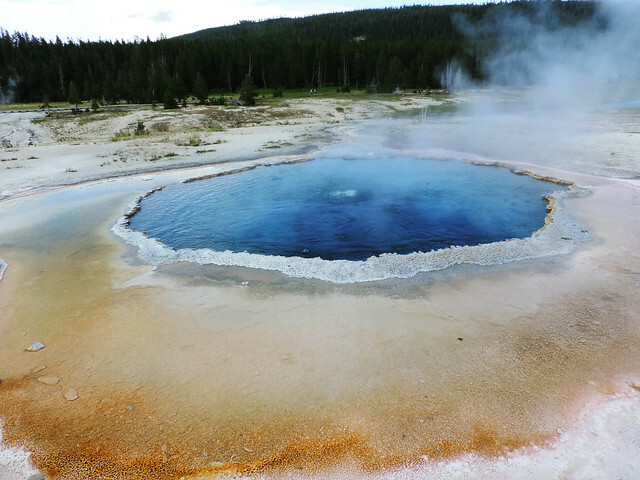 Biscuit Basin and Black Sand Basin are two smaller geyser basins close to the Upper Basin. We’ve seen the most eruptions during our visit in these basins. These eruptions were not so big as what we’ve seen in the Upper Basin, but they happened quite often and some of them lasted very long. West Thumb Geyser Basin is located on the shore of Yellowstone Lake. We didn’t see eruptions here, but the beautiful deep blue pools with Yellowstone Lake in the background quite made up for it. 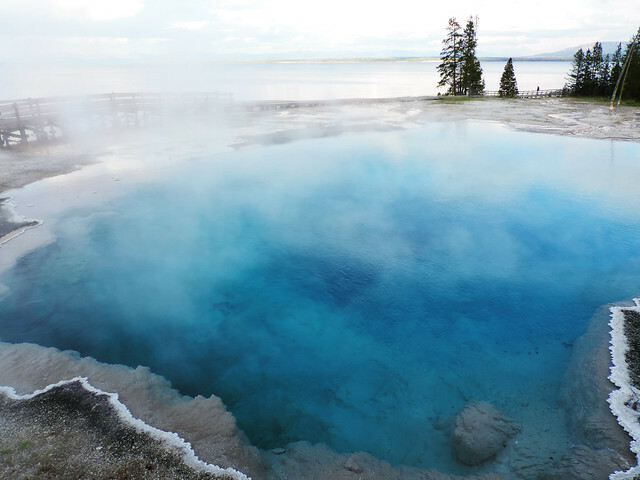 Norris Geyser Basin is the hottest in the park and it’s the most exciting and unpredictable for scientists. Because of the same reasons it can be less exciting for visitors: geyser eruptions here are impossible to predict and most of the geysers erupts rarely – I mean once in ten years is rare, right? The hot springs are pretty though and we liked Porcelain Basin the best. It’s a part of Norris Geyser Basin with unique milky pools. Lastly, Midway Geyser Basin. 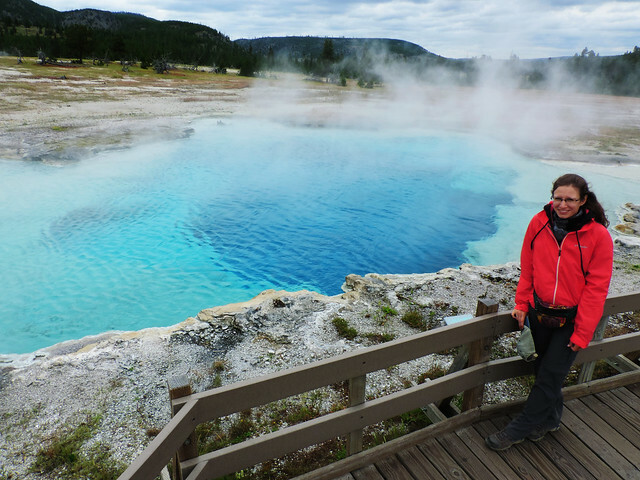 It was spectacular to us not because of its geysers but because of its colorful hot springs. Including Grand Prismatic Spring. 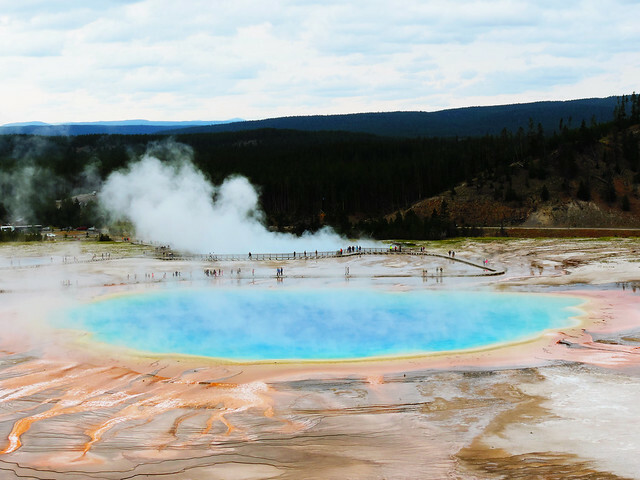 Grand Prismatic Spring is the largest of Yellowstone’s colorful hot springs. Its expanse stretches approximately 61 m across and its temperature is 160 ℉ (70 ℃). But what makes it so special is that it looks like a rainbow on the ground. In addition to the amazing blue colors, there’s yellow, orange and brown colors in it. They are caused by heat-loving microorganism. Yeah, there is life in these hot pools! 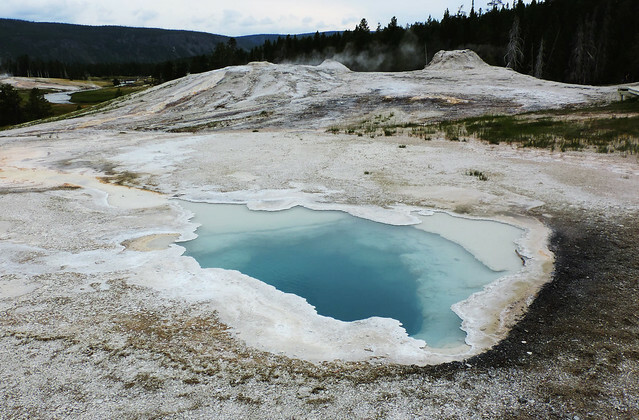 There’s another special kind of hot spring in Yellowstone: Mammoth Hot Springs. 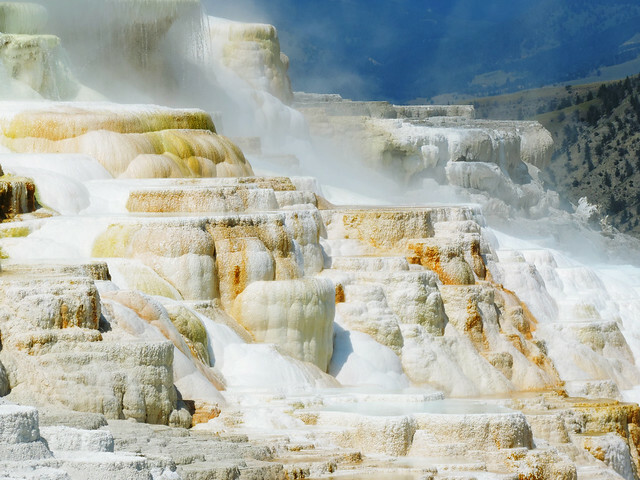 Here hot water ascends through ancient limestone deposits and the result is the colorful terraces of Mammoth Hot Springs. We could explore them on a boardwalk leading around and across the area. Is Yellowstone on your bucket list? What kind of natural phenomena get you excited?